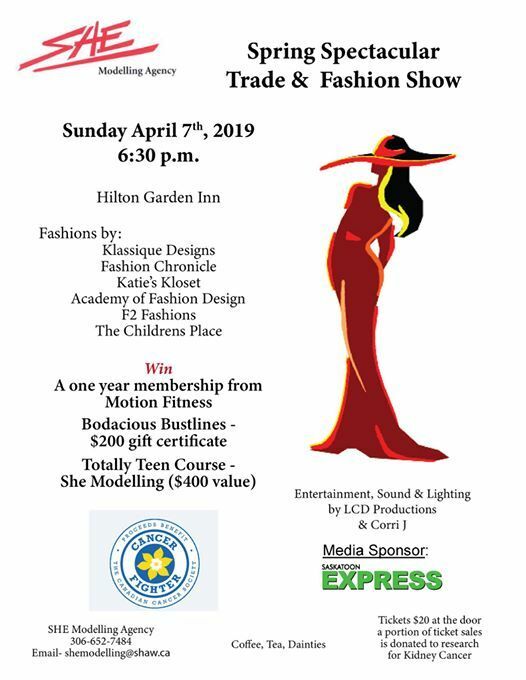 We invite you to join us in support of the Canadian Cancer Society for Kidney Cancer at our SPRING SPECTACULAR TRADE & FASHION SHOW at the Hilton Garden Inn, on Sunday, April 7th at 6:30pm. Browse beautiful displays showcasing the latest in Health, Beauty, Fashion, Fitness, and Lifestyle for everyone, AND wonderful door prizes to be won too! We are excited to partner with The Canadian Cancer Society for Kidney Cancer. 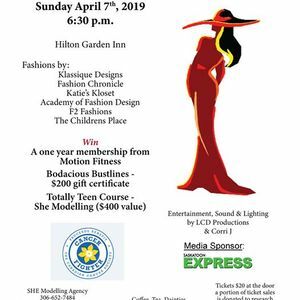 A portion of the proceeds from the Spring Spectacular Trade & Fashion Show will directly benefit those with Kidney Cancer and the much needed research and support that they need. Don't miss the opportunity to help this wonderful cause and have a lovely evening out with the whole family! 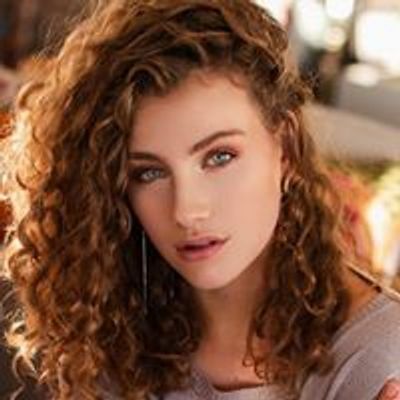 For more information see our website at shemodelling.com or call 306-652-7484. As always, this is a Child and Family Event. Tickets available at SHE Modelling Agency at 306-652-7484, and also available at the door! Our Spring Spectacular Trade & Fashion Show has been very successful for the past thirty three years! This opportunity hits the perfect demographic for your business and a very cost-effective way to advertise. Don't miss this chance to show off your business to approximately 300 -350 people! Please call Mary at 306-652-7484 for more information. FULL EVENT.Easter Saturday Egg hunt and farm tour!